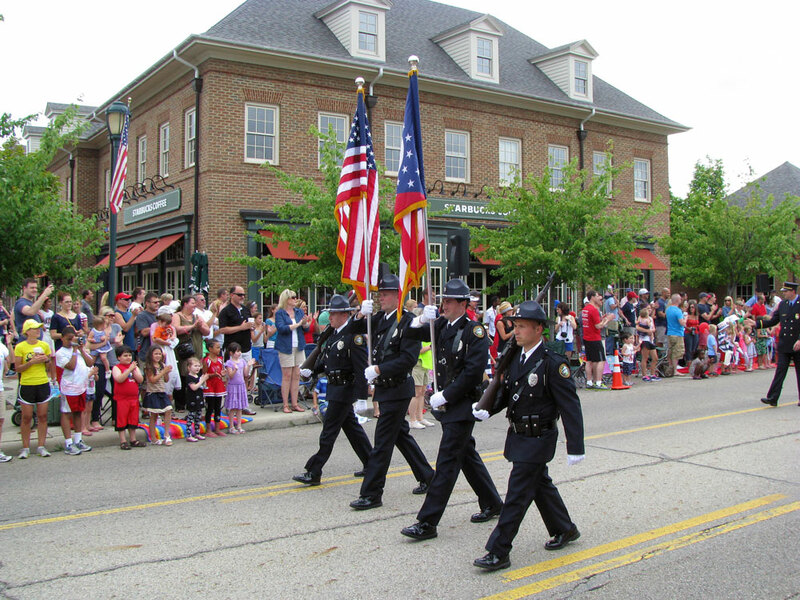 New Albany is one of Ohio’s safest communities and a reason for this low crime rate is the strong interaction between our officers, residents and businesses. Whether performing vacation house checks, patrolling neighborhoods or conducting bicycle safety programs for children, our officers understand that strong relationships set the foundation for a safer community. New Albany officers are also deeply committed to upholding the values of professionalism, integrity, respect and compassion to those they serve and protect. Our school district partners promote the idea that if you see something, say something and report it. We couldn’t agree more. Even though New Albany’s crime levels are low, please report suspicious activity to the police at 614-855-1234. Those who believe an activity could be a life threatening emergency should call 9-1-1 immediately. When callers are scared or agitated, they are sometimes difficult to understand. Staying calm helps get questions answered more quickly and the appropriate help dispatched more easily. State the nature of your problem quickly and clearly. Until dispatchers know the nature of the call, they cannot begin to ask the questions most relevant to solving the problem and sending help. When calling 9-1-1, state the problem and be prepared to answer follow-up questions. Be prepared to give your location and phone number. In most cases when someone calls 9-1-1, the address and telephone number are immediately available to the dispatcher; however, cellular callers cannot be located unless they tell us where they are. If you don’t know an exact address, look for intersections or landmarks such as nearby businesses. Memorize your mobile phone number. Answer the dispatcher’s questions simply and directly. When asked yes or no questions, reply simply yes or no. If asked to describe something, be prepared to provide as much detail as clearly and concisely as possible. Follow any instructions that the call-taker gives you for your own safety. Don’t hang up when you think that the conversation is over with the call-taker. The dispatcher on the phone is your link to the officer, paramedic or firefighters en route. In many cases, field units en route to a call may ask questions that the dispatcher needs to ask the caller. Also, staying on the phone during a crisis or altercation will potentially allow the call-taker to hear a crime or will let us know that you are safe. Per policy, New Albany police officers respond to all 9-1-1 calls where the caller either hangs up prior to the dispatcher completing the call, or when there is an open line or accidental call. Dispatchers will call the number back, but a police response will also be sent in order to ensure that what the caller stated is happening is in fact happening. If you call 9-1-1 accidentally, please stay on the line so that the dispatcher can speak to you. Dispatchers log each officer’s activities daily in the computer aided dispatch (CAD) system, information which includes arrive-on-scene times, disposition and in-depth information on each call. Our dispatchers also enter warrants, protection orders, missing persons, stolen vehicles, stolen license plates, stolen guns and stolen articles into the LEADS and National Crime Information Center (NCIC) computer systems. All dispatchers of the New Albany Police Department are state of Ohio Notary Publics and their Notary services are available to the public, free of charge, 24 hours a day. The dispatch communications center itself, located at 50 Village Hall Road, includes two fully functional dispatch stations and one call-taker station if needed. Both dispatch stations are equipped with CAD (computer aided dispatch system) and RMS (records management system). Each station is also equipped with up to date 9-1-1 phone lines and state-of-the-art phone systems. With the explosion of smart phones and other mobile devices, residents can now provide tips through the MyPD smart phone app. The MyPD app won’t replace 9-1-1 by any means. If you see something happening that may be a medical or life threatening emergency, please call 9-1-1 immediately. But for those times when you have a general police question, have information about an ongoing investigation, or want to provide feedback about our staff, this app allows you to conveniently access your police department at the touch of an icon on your mobile device. MyPD also allows you to download pictures along with text, something you can’t do over the phone. This information then automatically gets sent via email to the New Albany police dispatcher on duty. Those downloading the app will be asked to insert the country, state and city they want to download. The country and state fields must be chosen before you can enter New Albany as the city. The entire process takes no more than a couple of minutes. Once New Albany is chosen and the app is downloaded onto your mobile device, residents have another easy 24/7 means of access to their local police department. For those submitting questions, please remember to insert contact information or police staff will not be able to respond. New Albany utilizes CodeRED™ to notify the entire community or targeted areas in case of an emergency or urgent situations that require immediate attention. CodeRED™ is a high-speed telephone communication service available for emergency notifications. Examples of notifications may include natural disasters (tornado warnings/watches, fires), man-made disasters (terrorism, chemical spills, gas leaks), search and rescue (missing children, adults or disabled persons) and crime (prisoner escape warnings, sexual offender/predator alerts). CodeRED™ uses a database of phone numbers and emails that is offered at no cost to residents and businesses. The information in the CodeRED™ database is secure and confidential and will only be used for emergency notification purposes. Please click here to register for CodeRED™. Severe Weather Awareness – residents can receive severe weather alerts as part of their CodeRED™ registration. Additionally, residents can learn more about how to prepare for severe weather events at the Franklin County Emergency Management and Homeland Security website: www.franklincountyohio.gov/emahs. The New Albany Police Department offers a variety of programs geared to keep residents and businesses informed and engaged. From block watches to Safety Town to school resource officers, our officers and dispatchers value the opportunity to interact with the community to develop relationships that set the foundation for a safer community. Your child has the opportunity to participate in our upcoming bicycle rodeo, an event that teaches safe bicycling skills to children ranging in age from 5-12. The bicycle rodeo will include a safety inspection and a series of skill stations directly related to everyday bicycling situations. Participants will practice starting and stopping, safely exiting a driveway, the proper way to look for traffic, negotiating an intersection, and avoiding common road hazards that often lead to accidents. Participants can also go on a training ride through the trails at Swickard Woods under the supervision of a New Albany Police bike officer. We encourage your child to attend this educational bicycle safety event. To participate, make sure your child brings a bicycle and helmet. The New Albany Police Department maintains several active Block Watch programs. If you live in New Albany and are interested in starting a Block Watch program in your neighborhood, please contact the department at 614-855-1234. The Crime Awareness for Business Program was developed to decrease crime by increasing awareness among the business community of potential crime situations. As part of this program, businesses contact the police department to report suspicious activities and persons of interest with the intent of having police share this information with other businesses. On a consistent basis, police staff will distribute this information via email, as well as other crime awareness tips, to area businesses. Upon request of confidentiality, a business may request that certain information not be shared as part of the CAB Program. For more information, email: mham@newalbanypolice.org. This self-defense program is open to females 18-years-of-age or older who are interested in obtaining self-defense training and understanding the options they have when encountering sexual assault, harassment, domestic violence or other types of crime. The class covers current statistics, laws and common crimes of choice, as well as awareness, self-defense tactics and risk recognition. This high-impact course teaches easy-to-use self-defense techniques, not martial arts. The department has offered this free, multi-day course to more than 1,000 women. Registration is on a first-come, first-served basis. Call 614-855-1234 for more information. Digital (Webcheck) and rolled inked prints on form FD-258 fingerprinting services are offered to the public. Those who require fingerprinting services for a background check can be fingerprinted on Tuesdays, Wednesdays, and Saturdays. This service is by appointment only. To schedule an appointment, please call 614-855-8576. If you are in need of digital prints, please bring this completed form with you to your appointment. BCI and FBI reason codes are required to complete your digital fingerprint transaction. New Albany residents and those who work within New Albany corporate limits will be charged $25 for digital fingerprinting associated with state background checks and $30 for digital fingerprinting associated with federal background checks. Processing prints on form FD-258 are no charge. The general public who neither live nor work in New Albany will be charged $35 for digital fingerprinting associated with state background checks and $40 for digital fingerprinting associated with federal background checks. Processing prints on the FD-258 card is a $10 charge per card. Education is a community core value and New Albany City Council has consistently underwritten all costs associated with the school resource officer position stationed on the New Albany Plain Local Schools campus throughout the school year. The New Albany Police Department assigns a school resource officer and DARE office on the school learning campus. Speed trailers are frequently utilized to help educate and slow motorists on New Albany streets. These trailers are deployed to streets where complaints occur and where those complaints have been confirmed by a Stealth Stat traffic study. New Albany police have two trailers. They don’t collect traffic information and no camera is used to cite speeding motorists. When deployed, these trailer display posted speed limits. When approaching vehicles exceed the posted speed limit by a pre determined amount, the sign board will begin flashing the vehicle’s speed. Additionally, red and blue strobe lights on the side of the sign board will flash to obtain the motorist attention and alert them of their speed. The speed trailer is often deployed before officers begin speeding enforcement. Educating motorists of the speed limit and their vehicular speed to gain voluntary compliance to the speed limit is preferred over writing speeding citations. To request the placement of speed trailer on a particular street, please contact the police department at info@newalbanypolice.org. The New Albany Police Department uses Stealth Stat, a device to gather information about traffic on roadways. Unlike the speed trailer, Stealth Stat is small and blends in with the surroundings so that it does not influence motorist driving habits. Stealth Stat provides an 85th percentile speed of vehicles traveling along a road, a number reflecting the average speed of the vast majority of motorists. Stealth Stat also can provide the ten mile pace, which is the ten mile per hour range that contains the greatest number of vehicles surveyed. Because most drivers are law abiding safe drivers, the 85th percentile speed and ten mile per hour range are two factors used in determining appropriate speed limits. When the police department receives a speeding complaint for a particular road, a Stealth Stat survey is often one of the first activities completed. Data from Stealth Stat surveys assists police staff in determining if a speeding problem is perception or reality. Sometimes complainants believe cars are speeding on their street but a Stealth Stat survey indicates otherwise. The New Albany Urban Deer Management Program, which began in 2004, has successfully decreased the number of vehicle-deer crashes in the community while simultaneously decreasing complaints from local landowners who experienced landscape damage caused by overgrazing. Hunting in New Albany is prohibited except on land that is designated to be part of the Urban Deer Management Program and only then by hunters who are annually chosen and officially recognized by the New Albany Police Department to be a part of the program. For land to be eligible for the Urban Deer Management Program, the landowner must sign a Hold Harmless Agreement and the area to be hunted must be approved by the police department and be given a hunting zone number. Due to construction and land sales, the number of deer management program hunting zones continues to decrease. As a result, fewer hunters are needed, and the New Albany Police Department will not allow any new hunters into the program for the 2019 season. Hunters shown to be active participants in the program, have private land access and live in New Albany corporate limits will be given preference. Selected 2018-19 hunters will be notified by email or phone call. Only those notified by the New Albany Police Department will have the opportunity be a hunter of the 2019 season. With fewer hunters eligible this year, there will be only be one meeting offered that selected prospective hunters must attend. The New Albany Deer Management Program will be re-evaluated again after this hunting season and eligibility for all hunters is subject to change. Program updates will be posted on this page. In our continuing efforts to make the community as safe as possible, the New Albany Police Department provides free vacation house checks to residents. By completing and submitting the online form here, the police department will check on your residence during your time away from home. Always remember to call 614-855-1234 when you return home to cancel your vacation house watch. AMBER Alert – A voluntary partnership between law-enforcement agencies, broadcasters, transportation agencies, and the wireless industry, to activate an urgent bulletin in the most serious child-abduction cases. Department of Justice: Office on Violence Against Women – Provides federal leadership in developing the nation’s capacity to reduce violence against women and administer justice for and strengthen services to victims of domestic violence, dating violence, sexual assault, and stalking. Department of Justice: Office for Victims of Crime – Committed to enhancing the nation’s capactity to assist crime victims and to providing leadership in changing attitudes, policies, and practices to promote justice and healing for all victims of crime. Franklin County Children Services – Provides protection, care and permanency for children who are abused, neglected or dependent. National Center for Missing & Exploited Children – Serves as the nation’s clearinghouse on issues related to missing and sexually exploited children. Safe Kids Worldwide – A global organization dedicated to preventing injuries in children. Sexual Assault Response Network of Central Ohio (S.A.R.N.C.O.) – Sexual violence intervention and prevention program serving Franklin County. The Partnership at Drugfree.org – Translates the science of teen drug use and addiction for families. U. S. Immigration and Customs Enforcement Victim Notification Program – Allows eligible victims and witnesses to obtain reliable and timely information regarding a criminal alien’s release from custody. New Albany police officers understand that strong relationships set the foundation for a safer community.